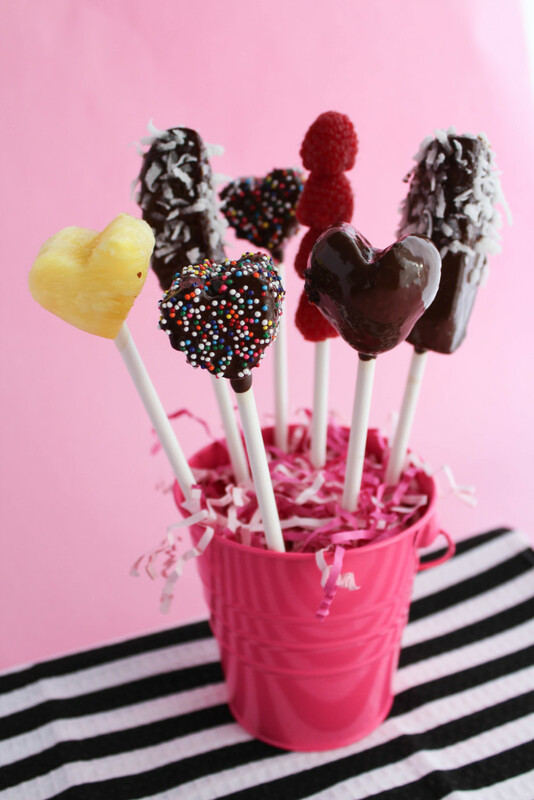 Chocolate dipped mini fruit bouquets are the perfect sweet treat to gift your loved ones for Valentine’s Day this year! Can you believe that Valentine’s Day is in a week? I can’t. I’m still trying to figure out where January went! As I get older, it seems that my days are more busy and time seems to pass a whole lot faster. It’s hard to remember to take in all of life’s little moments and appreciate them. But there is one thing that I’ll be appreciating this upcoming weekend…70 degree weather! I’m heading down to Las Vegas for an annual weekend trip with close friends and family and couldn’t be more thrilled to escape the snow and cold. Getting out of town for the holidays is always more fun for me. I feel like it takes a lot of pressure off to plan really extravagant things and to just enjoy the people you’re with. Plus, who doesn’t like a change of scenery every once in a while?! If you’re staying home and stressing over what to make for the loved ones in your life, I’m sharing a cute little project, that’s fun for the kids to make too!